WEST LAFAYETTE, Ind.  Purdue University dedicated two theaters and its new visual and performing arts building today (Monday, Sept. 12), setting the stage for a place where art and technology can meet. The $43.4 million Yue-Kong Pao Hall of Visual and Performing Arts is the College of Liberal Arts' home to the four divisions that make up visual and performing arts: art and design, music, dance, and theater. "This building is a testament to the breadth of the arts at Purdue and our own emphasis on bringing technology to the stage," said President Martin C. Jischke. "This is the first building at Purdue named after an international business leader, a visionary who helped bring the market economy to China. The donors include a leader in the video game industry, a former Purdue president and engineer, a professional in the pharmacy industry, and a mechanical engineer. Art plays a part in every discipline and in every heart, and this building provides a place where designers, artists and scientists can experiment with art to improve the human condition. "The arts have always played an important role on campus, even when they were scattered among different buildings and facilities. Now, the artists can create, design and solve problems under one roof using some of the latest technology." The fund raising was completed last fall, thanks to an anonymous $4 million gift. At the request of the donor, the building was named after Yue-Kong Pao (pronounced u-KONG bou), who died in 1991. Tom Adler, interim dean of the College of Liberal Arts, said the new facility has something for everyone. "Within this building, teachers, students and patrons will come together in an arts community that melds art and technology with the spark of creativity and imagination," Adler said. "Not only will the public be engaged by performances and exhibits here, the state will benefit from the imagination, ingenuity and insight that are fostered here." Within the Indiana economy, for example, there are nearly 50,000 people working in arts-related businesses, according to a study conducted by Americans for the Arts, which is a nonprofit organization advancing the arts. Among those working in Indiana are artists trained at Purdue. "This building provides a place where we can exhibit the fine arts, such as painting, sculpture and drawing," said David Sigman, professor and head of visual and performing arts. "But the building also is its own canvas where artists and scientists can work together to solve problems. For example, new studio space allows industrial designers to create and enhance furniture and appliances that are a part of our daily lives." 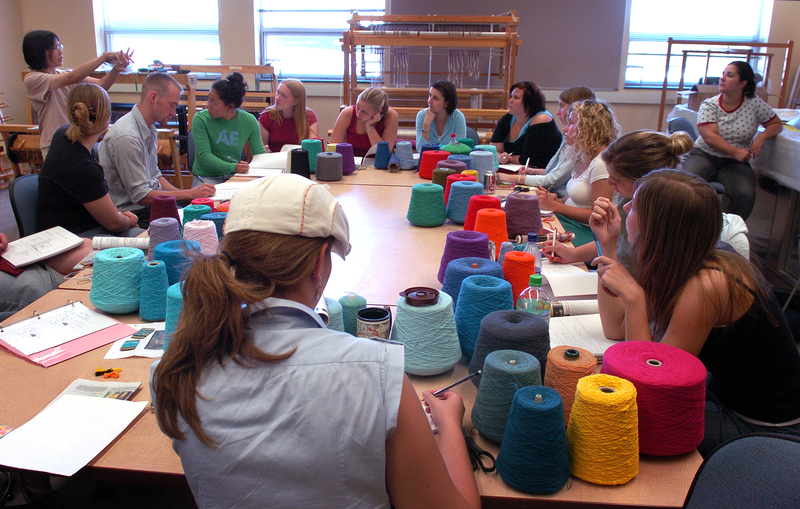 Pao Hall not only provides space for interdisciplinary collaboration, but it also offers opportunities to use some of the latest technology, such as in computerized weaving. The new dance space allows dancers to utilize computer technology in motion-capture video imaging, which is used to produce video games. "Students will learn how art can be used to solve problems, and the opportunities provided by this building will prepare Purdue graduates for careers in interior and industrial design, sound and lighting, and printmaking, to name just a few," Sigman said. The 166,700-square-foot hall is located at Marsteller and Wood streets. The building, which received $20.75 million in state appropriations, opened in fall 2003 for classes in art and design and dance. Purdue also contributed $5 million, and the remainder came from private gifts. Purdue has just finished work on the second phase of the building  two theaters and space for costume design and storage, dressing rooms, prop storage and scenery construction as well as studios and workshop space for classes in theater, music and art education. Previously, the visual and performing arts areas were located in Stewart Center, Lambert Field House, Matthews Hall and in five Quonset huts that dated back to World War II. The Nancy T. Hansen Theatre, a 300-seat proscenium, will take the place of the Experimental Theatre in Stewart Center and nearly double its seating capacity. 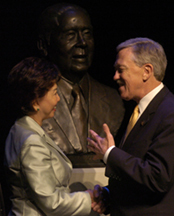 Former Purdue President Arthur G. Hansen of Zionsville, Ind., in September 2002 announced an outright and deferred gift of $1.8 million to name the theater in his wife's honor. Arthur married Nancy Tucker in 1972 during his tenure as Purdue's eighth president (1971-82). Nancy Tucker Hansen died in 2003. "Both theaters will offer incredible artistic opportunities for production," said Russell Jones, associate professor of theater and chair of the division. "The Hansen Theatre has a grid 65 feet above the stage that will allow us to quickly fly scenic elements on and off the stage area. The stage is fully trapped, meaning the floor is easily removable, so we can sink props or scenery into the floor of the stage." Directors will be able to experiment with different entrances and exits for plays with stage flooring that moves and with the new computer controlled lighting and sound technologies in the lighting and sound booth. "The stage opening alone, with an increase in height from 12 feet to 28 feet, allows us to pursue productions that require two-story settings," Jones said. "Even though the size has increased, we've captured the intimacy of the actor-audience relationship that was appreciated in the smaller Experimental Theater." In February, Purdue Theatre will present "The College Widow," written by Purdue alumnus George Ade, as the first production in the Nancy T. Hansen Theatre. "The Carole and Gordon Mallett Theatre is truly a teaching theater," Jones said. "This flexible theater seats 100-150 people depending on its configuration. Directors can divide the audience seating or shape it to an arena, proscenium or three-quarter form. There also is more room for better lighting effects and an improved technical gallery." The Mallett Theatre will replace the smaller Black Box Theater that was located in Creative Arts Building 3. Gordon Mallett of Zionsville, Ind., a retired Eli Lilly and Co. quality assurance director, studied the sciences while at Purdue, earning a doctorate in microbiology in 1956. Carole is a retired school administrator who took undergraduate courses at Purdue before earning her bachelor's and master's degrees in education from Bradley and Northern Illinois universities. The Malletts pledged outright and deferred gifts of $770,000 for the building and also contributed time to the visual and performing arts building fund-raising campaign. A green room also has been named for Herbert and Janice Wilson of Coralville, Iowa, in honor of their $500,000 gift in 2000. Herbert, who earned his bachelor of science degree in 1951 from Purdue, is owner and president of Start Ups Unlimited Inc. in Coralville. Portraits of the Malletts and Nancy T. Hansen also were unveiled in the new theaters at the dedication. A gallery in the building is named for Patti and Rusty Rueff (pronounced ROOF), of Burlingame, Calif., in recognition of their $200,000 gift toward the building. Rusty received a bachelor's degree in radio and television from Purdue in 1984 and earned a master's degree in counseling in 1986. He is now executive vice president of human resources at the Redwood City, Calif.-based game developer and publisher Electronic Arts, where he is responsible for finding and hiring the talent to create and produce the company's top-selling video games, such as Sims. In March 2004, the Rueffs also made a deferred commitment of $5 million  the single largest gift in the College of Liberal Arts' history  for the Department of Visual and Performing Arts, which was named in their honor. Previously, a classroom had been named after the Rueffs' godson, Noah B. Putnam, in honor of a $50,000 gift. Rusty, originally from Jeffersonville, Ind., is a member of Purdue's fund-raising campaign committee for the Visual and Performing Arts Building and the College of Liberal Arts Dean's Advisory Council. Patti is an event-planning consultant in California and a graduate of Wood Business School in Manhattan. She worked 24 years for PepsiCo Ind., including 20 years as executive assistant to the CEO and chairman of the board of directors. Yue-Kong Pao was the founder of the World-Wide Shipping Company, an international oil tanker charter business. He became one of the wealthiest men in the world and was known as a shipping magnate, praised as one of the century's top 10 in that field. Pao was a friend and adviser to Chinese leader Deng Xiaoping, and he was responsible for arranging President Ronald Reagan's visit to China in 1983. Pao, who fled his homeland when the communists came to power in 1949, advised Deng to change the country to a market economy, according to the book "Three Tigers and Purdue: Stories of Korea, Hong Kong and Taiwan and an American University." Pao's two daughters graduated from Purdue. Anna Pao Sohmen is a 1966 graduate in psychology and sociology, and received an honorary doctorate from Purdue in 2003. Bessie Pao Woo graduated in 1971 with a degree in interior design. Anna and her husband, Helmut Sohmen, from Hong Kong, were at the dedication and unveiling of Pao's bust. Helmut Sohmen is president and chairman of World-Wide Shipping Company. Purdue has one of the largest international student populations, and students from China began attending Purdue during the early 20th century. This fall Purdue has more than 750 students from China studying on the West Lafayette campus. The Patti and Rusty Rueff Department of Visual and Performing Arts, which is home to Purdue Theatre and the Purdue Repertory Dance Company, was created in 1966. There are more than 900 undergraduates in the department, 60 graduate students and 40 faculty members. The department also offers a master of fine arts degree for students in its divisions of art and design and theater. More than 8,000 Purdue students annually enroll in visual and performing arts classes. The studio arts include painting, printmaking, drawing, photography, textiles, sculpture, ceramics and metals. Other popular areas of study are industrial, interior and visual communications design. Visual communication design includes the creations of logos, corporate identity systems, package design and motion graphics. Visual and Performing Arts is one of 11 departments in the College of Liberal Arts, which is one of the largest colleges on campus. The other departments are communication; English; foreign languages and literatures; health and kinesiology; history; philosophy; political science; psychological sciences; sociology and anthropology; and speech, language and hearing sciences. The college also is home to 13 interdisciplinary programs.